We covered some of the tricks behind NASA’s communication with spaceships a little while back, but the International Space Station’s internet access is pretty interesting. There are some significant challenges with getting the internet set up in space, beginning with not being able to run a fiber-optic cable from ground to space, and we still don’t have a planetary scale wifi network yet, so getting a wifi hotspot in space is still a challenge. The vast majority of communication with the ISS happens via radio. Radio is a pretty straightforward means of broadcasting information, and we’re pretty familiar with radio for audio recordings. (Your cars almost certainly still have radios in them, even if you plug them directly into an mp3 player instead.) Radio is pretty easy to set up, as you just need to have an antenna and a transmitter. Even more helpfully, the atmosphere doesn’t block radio waves, so you don’t have to worry about the air absorbing the signal you’d like to send out. This also means that the atmosphere won’t get in the way of shooting a signal up into space from the ground. In fact, radio waves are so straightforward that this is also how we communicate with most of our artificial satellites. We use a very narrow range of the available radio frequencies for the kinds of radio stations that your cars are sensitive to, but there’s a lot of other frequencies that we can use for other things. And, as is our way, we have used these other radio frequencies for other things. A GPS satellite, for instance, uses the radio to communicate with the ground. These satellites use a frequency range called “L band”, which ranges from 1GHz to 2GHz, which in turn works out to wavelengths of tens of centimeters and longer. Going from a GPS ping to sending data along the radio wave is relatively straightforward – and if you’ve got a data plan on your cell phone, you’re already doing it. The LTE network in the US is also roughly an L-band connection between cell phone and tower. The L-band is also of interest to astronomers, as it illuminates neutral hydrogen gas in nearby galaxies. This overlap in frequencies is one reason you’re not allowed to bring your cell phone near a telescope which is trying to observe in the L-band; you’d interfere with someone’s science data. The radio connection to the ISS isn’t L-band, it’s Ku band (12-18 GHz) and S band (2-4 GHz), but the principle is the same. We can beam a signal up to the ISS, which has an antenna which lets them receive it, and then their computers can download an email. To be more precise, typically we beam a signal up to a satellite and the satellite slings it over in the direction of the space station. However, there are limitations to how fast your radio-based connection can communicate, and one of the issues is distance from the source. When you’re beaming a signal to space, and power drops with distance, the rate at which you can communicate also drops. Unsurprisingly then, by all accounts the internet on the International Space Station is pretty slow. Astronauts rate it “worse than dial-up” but it’s at least there, and lets them write emails, post pictures on twitter, and call home to their families. Interestingly, Twitter only became a part of ISS life in 2010! Before 2010, the access to the internet was pretty limited, so if an astronaut wanted to put something up online they would have to email it to the ground team via their radio connection, and the ground team could log into their account on their behalf and post it for them. Considering that the ISS has been going since 1998, this is a relatively recent upgrade. There is another potential upgrade to the internet in space being tested. The machinery for it was delivered by one of the SpaceX capsules in April, 2014, called OPALS. Opals stands for Optical PAyload for Lasercomm Science, and it’s successfully gotten data down from the ISS to a listening station in California. OPALS is cool because it uses lasers, which means we’re switching from an analogue radio signal to an optical one. As anyone who happens to have fiber optic cables for their internet can tell you, optical data rates are way better than the alternative. If we get the ISS switched over to OPALS completely, the internet for the astronauts will speed up by a considerable amount – the OPALS team estimates it’ll be somewhere between 10 and 1,000 times faster than what they have now. Unfortunately the tech is still in the testing phase, so the internet won’t have a speed bump just yet. In order to really scale this up, you’d need to have listening stations all over the planet, and the laser itself will have to very accurately point itself at the listening station. When you’re moving as fast as the ISS is, pointing in the right direction is no mean feat. 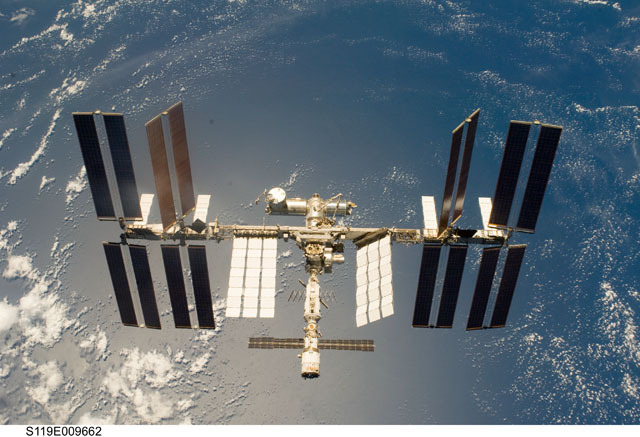 In fact, the ISS is moving so fast, there’s only about a minute and forty seconds of communication between the ISS and the current listening station before the space station goes over the horizon again. If this optical technology can be fully implemented, the ISS will enjoy the internet at significantly higher speeds through the wonders of laser beams! In the meantime, the ISS, along with a number of other uncrewed spacecraft, will continue to talk, video, send data, and tweet with the earth via radio signals, beamed down to us through a constellation of satellites.